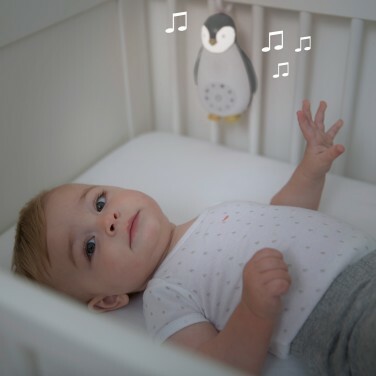 Soothe your baby in their cot or on the go with a sweet penguin music box that not only plays sound but lights up too! 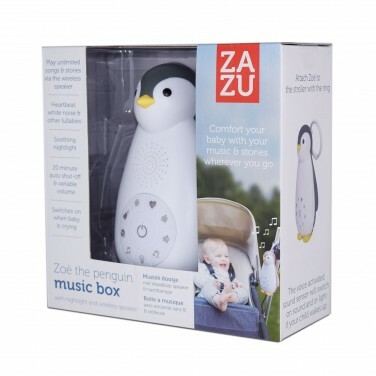 Zoe the penguin plays heartbeat sounds, white noise and three lullabies to help soothe little ones and has a wireless speaker function too so that you can play your baby's favourite music and stories from your mobile devices. Reassure little ones in the dark as the penguin's head becomes a soothing white night light casting soft, comforting light into your baby's space. The auto shut off automatically switches both the light and sounds off after 20 minutes, but should baby wake and become distressed, the voice activated sensor will play the sounds and light up again whenever your little one cries to help soothe them back to restful sleep. 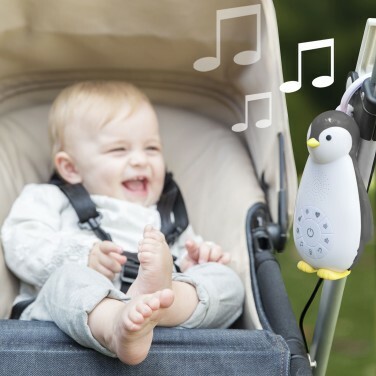 Rechargeable vis USB (included), there's no wires, and you can hang this cute little penguin on your baby's cot side or buggy or pram for comfort and reassurance wherever your baby goes.